Today i'm taking a look at a Pre production copy of a Football management board game, which is currently on Kickstarter, called "The Football Game" (would not have been my choice of title). play soccer. I'm not a huge soccer fan and I find watching it quit frustrating because of all the faking injuries and acting like over paid children. 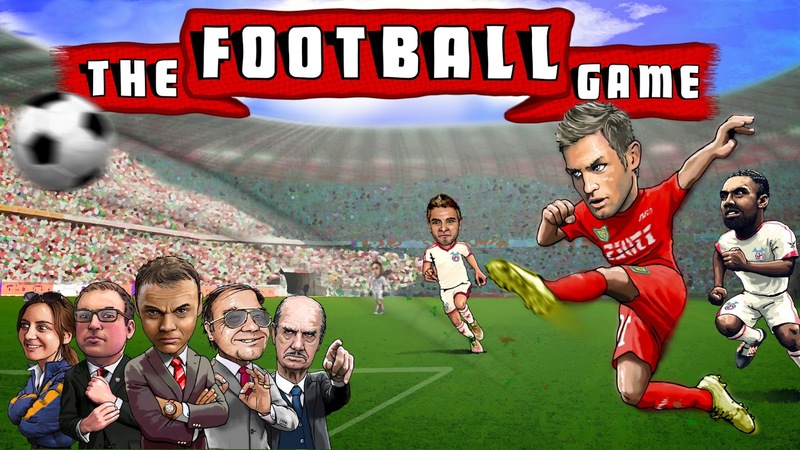 Why then, you might ask, did I agree to review a game about soccer management? 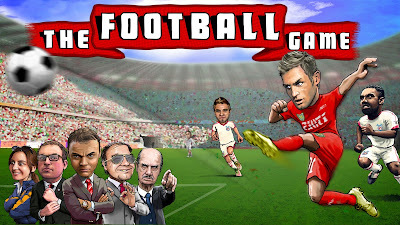 Well the truth is, I love the computer game Football Manager, were you are in charge of a soccer team from season to season and make lots of decisions about its future. 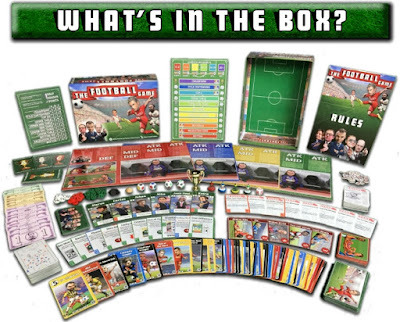 I have always wanted there to be more sports management board games and so when I found out about this game I jumped at the chance to see what it was like. So on balance, I'd say when if comes to this theme I am reasonably neutral. I am not going to go into detail about how to play games in my reviews, there are lots of how to play videos / reviews out there. I will however talk about what the main nuts and bolts of the game are and how well they work. 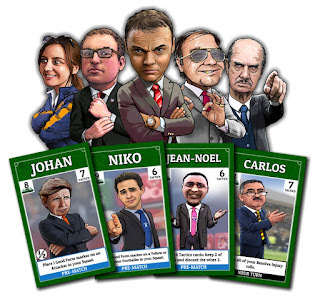 In The Football Game you have two main resources to play with, player cards and tactics cards. There are also random event cards but they are not something you really have any control over and I'll cover them later. Their rating from 1 to 5 - this tells you have good they are. Their position - which tells you which slot in the team they can fill. 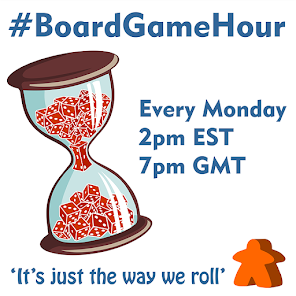 The game play is pretty simple, but it offers a good narrative to game play and some interesting decision points. 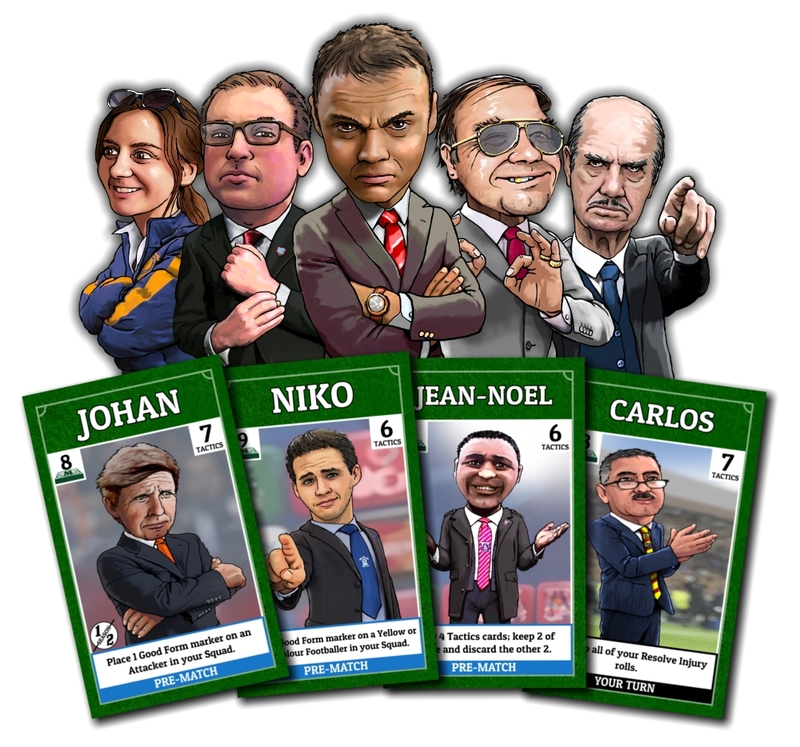 In short, each manager (they have individual special abilities) fills their 4 player slots with players of the correct position from there squad. These players will often be a fix of the four different play styles, but you can use what ever mix of colours you want / have available to you. 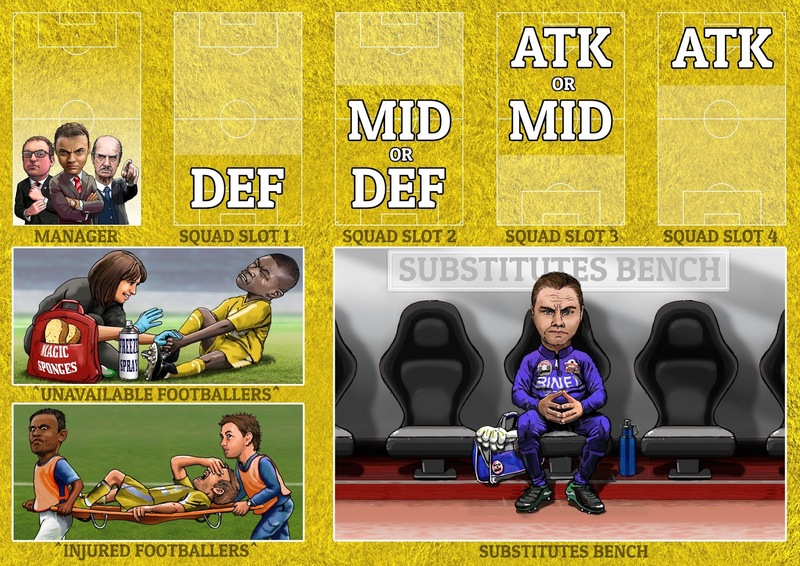 Once the teams have been picked for the week, each player can play pre-match tactics cards. 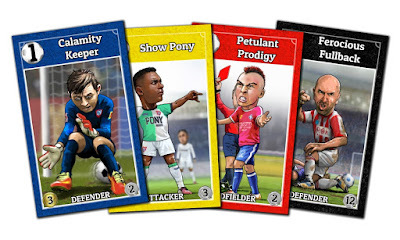 Some of these cards are "take that" cards which you play on other players. Others are going to affect which players you want to put into your line up or allow you to effectively double down your bet on some players scoring. 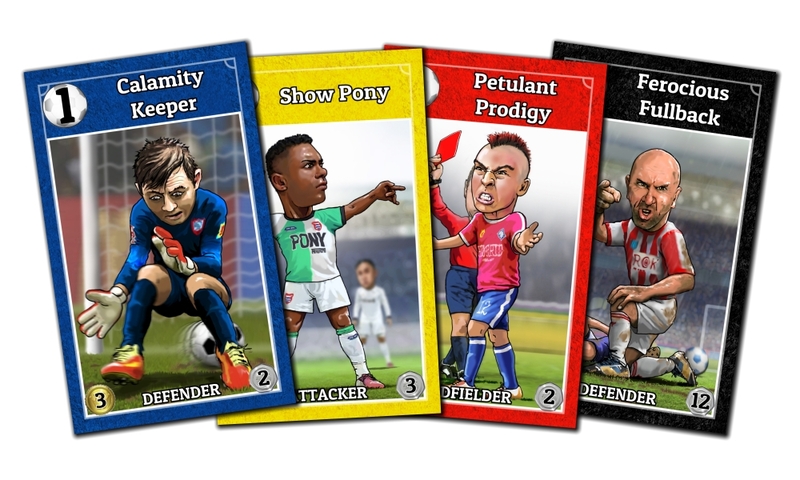 To understand what choices you might make regarding player choice or which tactics cards you might want to play, you need to understand how each round climaxes. Each round the player who's turn it is, rolls both of the match dice and both event dice. 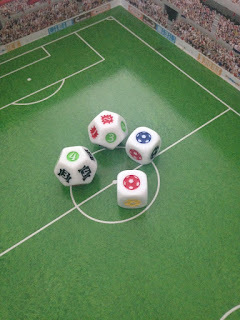 The Match Dice are 6 sided dice which, when both are rolled, have an equal distributor of the 4 colours that your football player can be (Red, Black, Yellow & Blue). These indicate which colour of player scores. 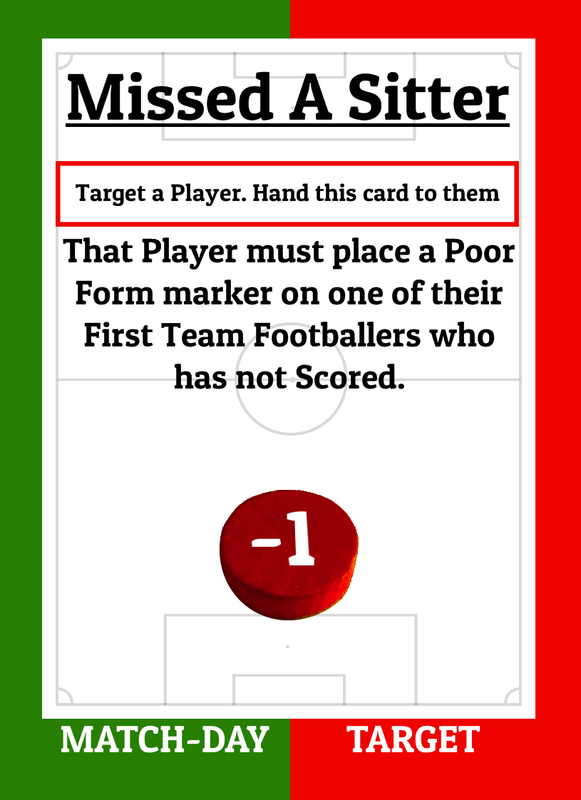 After the dice have been rolled players get to play match day tactics cards that effect players and scores. Once scores have been totaled, teams move up and down the table respectively. 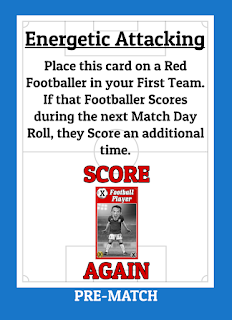 Then the random events take place which range from injury to free transfers and many others. At first there doesn't seem to be anything in the game that can mitigate the level luck, but as you play more you notice that the choices you make can have an impact. The main thing I would say about the mechanics is that they are simple to learn and that there was enough meaningful choices happening that I was engaged all the way to the end. I like that there is no down time. The mechanics (of which I have not covered all of them) are pretty solid if not amazing. I also felt like they really created the option to add a narrative to the game, we were often reading stories into situations that where just random, but there is enough character in the game to allow you to do this! You are playing as both the CEO and Manager of a Soccer team trying to lead your side to glory. Does it feel like this? Well, frankly, yes! I was skeptical coming in that it could be pulled off, but the luck and card play really gives you a good taste of the theme. Sports management is full of luck, and so is this game, but that no bad thing for me. Past that.. The artwork is just brilliant! There is so much character in the game. You even get a miniature trophy as the first player marker. If you are a euro game loving control freak who is going to complain that you would have won if it wasn't for the "poor dice rolls" stay as far away from this as possible! Also if you don't like take that mechanisms this is possibly not for you either. You don't have to love soccer to enjoy this game at all. If you do, all the better, but its not needed. The main type of person i'd recommend this game to is someone who likes emerging narrative in a game. If the enjoyment of the journey with some fun choices along the way its for you. If planing and executing tactics while riding your luck is what you enjoy, this is for you. It cost me a lot of brownie point to persuade my partner to sit down and play The Football Game, but in the end she did. I read the rules and we set it up, impressed by the components. 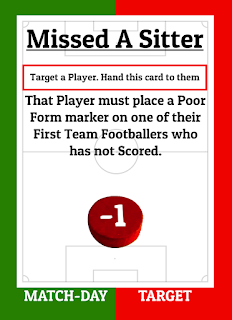 For the first round or so we had issues with things like tactics cards which could be played either way up, but then we got our head around some of the conventions. 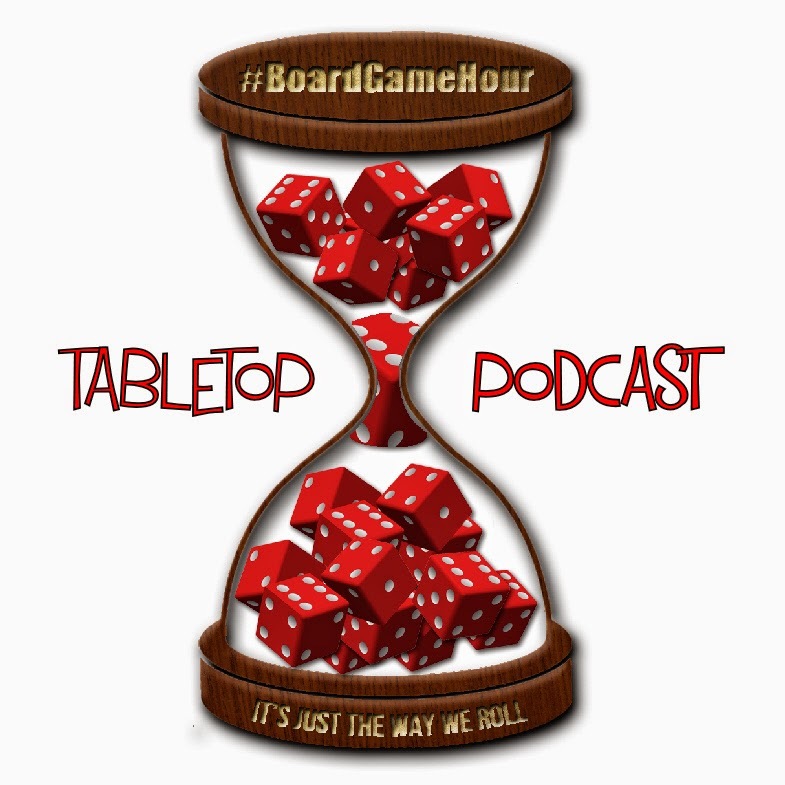 This is not unlike lots of board games out there that take a round or two to work out. Once we broke through this initial small barrier we really started to see the options and get into the game. By half way though the game we where taking the mick out of each others players and creating stories about what was happening in the games. We where planning our tactic and really getting into the game play. All in all, the game hung together really really well. We where both tired when we started the game, but it didn't outstay its welcome and the climatic ending was great fun. Here is why you should seriously consider backing this game today; after we had put the game away, my partner turned to me and said "I'd play that again... Fancy another go tomorrow". Now that is the sign that a game has universal appeal.